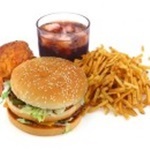 We define a junk food as, a food that is likely to do more harm than good to the body. We’ve used hot dogs as our, pardon the expression, model junk food. They’re high in saturated fats, hydrogenated fats, added sugars, additives, food colorings, nitrates, and nitrites. White flour, hydrogenated oils, icing, lots of sugar Potato chips hydrogenated oils, high in salt. Even though white is a symbol of purity, even health, when it comes to the nutritional value of foods, white has been black-listed. This is especially true in foods that have been man-made white by processing, such as white flour and white rice. In these two foods, the most nutritious brown part of the food (the bran; and in wheat, the germ) has been factory-removed by processing or bleaching and the colorless stuff that remains is nutrient-poor. Even a naturally white potato, though nutritious, is less so than its yellow friend, the sweet potato (which botanically really isn’t a potato). So, leave the white bread for the birds. Think brown.